I hope your week’s going well. 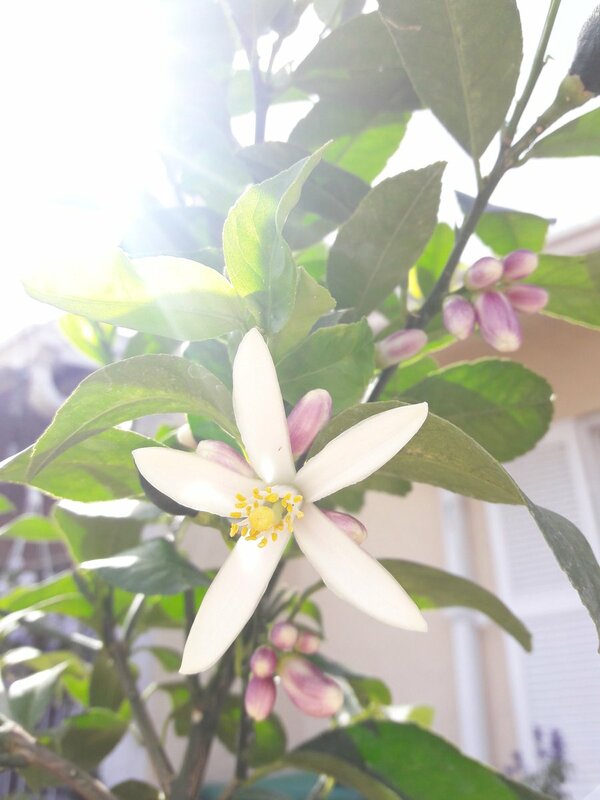 It’s so sunny here where I live, and I’ve decorated my front patio with all kinds of plants and flowers, including a beautiful lemon plant. Right now, it has about twelve lemons that should be ready to harvest in the next 3-4 months, so I’m pretty excited about that. A few days ago, its new flower buds started to open, too, and to the right, I’ve included a picture of the very first flower (though it might appear elsewhere in the email if you’re reading this on your phone). Apart from developing a love for gardening (and–oddly enough–cooking…you can blame Pinterest for that), I’ve also been thinking a lot more about maintaining a positive mindset. As you well know, thinking more positively is one of the things I most like talking about on my blog. Thinking more positively is also something that I have diligently tried to practice for several years now. Don’t worry. We’ve all been there before, myself included. But recently, I’ve dared to believe that there just had to be a better way of doing things when it came to thinking positively. I didn’t want to fall off the positivity train with every setback or worry and end up spending days trying to get back to a place of peace and joy. What if I filled my mind with so much positivity that there simply wasn’t any room leftover for the negative? Think of it like this: your mind is a hotel, and there are tons of rooms available to rent. You can rent some rooms to travel plans, to thoughts on what to make for dinner, to your opinions on that new movie, to your reflections on a conversation you recently had. But you can also rent rooms to worries about your finances, judgments against other people, obsessions with all the ways you’ve been wronged in the past, and anxieties about whether you’ll really be able to accomplish your dreams in life. Here’s the secret: the thoughts you rent out the most rooms to…are the thoughts that are going to dominate your mind. If there’s nothing but worry, stress, judgment, pessimism, etc. upstairs, then everything you see and feel and experience will be through those lenses. But! If you can learn to put up ‘no vacancy’ signs whenever those negative thoughts come looking for room to rent in your head, I can guarantee your life will be infinitely more peaceful and joyful. This is something I’ve recently begun to put into practice, and let me tell you, it’s a life-changer! I’ve never felt so free and light before. The moment a worry or judgment enters my mind, my knee-jerk reaction is to say ‘Nope, not going there. Cancel, clear, delete.’ And then I just move on. Positive affirmations. I’d already been speaking positive affirmations aloud every morning, but I decided to up the ante by searching for affirmation videos on YouTube to feed my brain some new material. Here’s an example of one that’s focused on wealth. I’ve even programmed a daily reminder into my phone that simply says ‘Prosperity is coming to you now’. It’s a morale booster! And I’ve taped positive affirmations all over my house so that I always see them and can be encouraged by them. Abundance meditations. In addition to affirmation videos, I also started seeking out 15-20 minute meditations. YouTube is a treasure trove of meditation videos, but two of my favorite ones on the topic of abundance specifically have been this one and this one. Meditations can really put you in a peaceful state of mind that’s so relaxing and lovely. Positive Content. For a while, I’ve been pretty mindful of the type of content I watch on TV (for example, I don’t watch the news), but now I’ve started to introduce positive content instead of just eliminating the negative. So for instance, lately I’ve been watching an episode of Joel Osteen each day. I find his teachings encouraging, uplifting, and inclusive (I’ve heard about plenty of non-religious people who still like watching Joel Osteen). But the great thing about the internet is that there’s something for everyone when it comes to the teachers we listen to. I recommend going on YouTube and searching organizations like Hay House, Gaia, Omega Institute, and Ted Talks as well. Personal Development Reading. What are you feeding your brain in terms of books? Recently, I scoured my library for every book I could find on positive thinking and the law of attraction. If you’re interested in learning more on the subject and having epiphany after epiphany in addition to getting awesome tips for living a more positive life, check out what your library might have available and start letting your brain stew in encouragement for once. Vision Boards. I’m sure you’re no stranger to vision boards. I recently made a huge vision board that now hangs on a wall of my bedroom and it’s filled with pictures of all the things I one day expect to have. Surrounding yourself with things that you love can fill you with faith and expectancy, and remind you that good things are coming your way. The trick is this: every time you see the pictures, pause and say ‘Thank you’, believing that it’s already yours. Gratitude. I know you’ve probably heard of the importance of gratitude time and time again, and maybe if you’re like me, you got it…but didn’t really get it. After all, of course you’re grateful for what you have…so what more is there? Well, I’ve discovered there’s a difference between being generally thankful and taking out a conscious moment every day to speak your gratitude out loud. Recently, I’ve programmed a daily reminder into my phone. At 11PM every night, this reminder pops up and asks me to name one thing that happened today that I’m grateful for. It doesn’t matter if it’s something as small as a new recipe turning out well – I speak my gratitude out loud and consciously allow my body to radiate a sense of warmth and joy in thankfulness. Success stories. This one is a strategy you’ll definitely want to try! Sometimes, on the road to accomplishing our dreams, that mountain in front of us can look pretty insurmountable. But when we surround ourselves with the success stories of others, suddenly it doesn’t seem so big anymore. I’ve started to read all kinds of success stories – from unassuming indie authors who hit it big to every day people who manifested large sums of money in the nick of time. Whatever you need encouragement in, just Google it. For example: ‘money manifesting success stories’. Read stories as often as you want, and you’ll find your joy-thermometer going up. Joy-filled activities. Speaking of joy, how often do you make time in your day to do something you love? Isn’t it sad how sometimes we put our own interests, hobbies, and passion projects on the back burner? Self-love is so important to help you feel happier every day, and I’ve found that when I allow myself to do things I love, it boosts my positivity and keeps the good vibes flowing. Window-shopping. This one is tons of fun! I’ve enjoyed it immensely. I’ve read countless studies where simply planning a trip (even if you never intended on actually going on the trip) can do wonders for stress relief. So not too long ago, I planned a bunch of trips for 2018 that include stops in France, Spain, the Czech Republic, and several locations in the United States. I pretended like money was a non-issue and just focused on the dates I would go and the things I’d want to see while there. And it was invigorating! You can do the same for general window-shopping, too. Walk into any store and think ‘I can afford that’ when you come across something you really like. Pretend like you plan to buy it on your next trip. It gets good energy flowing in your body and allows you to stretch the limits for what your brain believes is possible. Creative visualization. I’ve talked about creative visualization before, and if you haven’t tried it yet, I highly recommend it. If you run a search for ‘creative visualization’, you’ll find plenty of information online about how to practice it. But basically, it’s like daydreaming. You picture yourself experiencing your dream life – what do you see, what do you smell, what do you feel, what do you hear? And you completely immerse yourself in that experience. Then you exude gratitude and faith that one day, it will come to pass. Remember, your mind is yours to control. You get to decide what thoughts are renting out the rooms there. If you want to only rent out rooms to the positive and put up the ‘no vacancy’ signs for the negative, the strategies above will help you to do just that. Feeling like I need a boost right now.